My Boat; building a 40 foot shanty boat / houseboat. 6 ton + to cruise the Murray River in South Australia. I have the floats (plywood pontoons) built, and currently working on setting them up level and plumb, to fit deck beams and floor. We are located about six miles from Mannum, in South Australia. The town is regarded as a center for holiday houseboats. There are approx.300 holiday hire boats based here, and a small support base for the design, building and maintenance of these craft. The vast majority of these boats are outboard powered steel (or more recently alloy) pontoon boats. My build is plywood on frame, so it`s not all that common, but there are a few smaller private boats built similarly. The design of this boat is a result of some consultation with some local builders and owners of similar craft that have given good service in the past. Now normally would always seek out a good suitable stock plan before starting a build , particularly of this size but after looking a long time , even on the internet , there appeared to be preciously little on offer. The closest I found was an aging design by Glen L (US) called the “Mark Twain”. This design came close to requirements, but the layout and payload (displacement) was a little less than I was looking for. This design is by someone calling themselves Key West Boat Works, but after several emails and attempts to contact them to order plans I have yet to even get a reply. I have since moved on. So, it seems a long winded answer but I thought I would explain how this design came about. Much more construction detail below. Cabin lining and insulation is almost completed. I am also making the ceiling panels , lining board bonded to 3 inch ( 75 mm ) foam. Bulkheads are at 1200 mm ( 4 ft ) centres , not 900 mm as stated. Deck beams are therefore spaced at 2ft centres . Mike , I could no longer log in , the site does not recognize my email address. Life on the river is good. I`m not online much anymore these days . All framing is seasoned Australian hardwood.The frames are (2) laminations of 90 x 19 mm ( 4 x 3/4 inch ) epoxy glued together to finish at 4 x 1 1/2 inches. All stringers are (2) laminations 45 x 19 mm ( 2 x 3/4 inch ). to finish at 2 x 1 1/2 inches. Keel strip is 90 x 45 .. ( approx 4 x 2 inch ) old seasoned Australian Jarrah hardwood. The bulkheads are 900 mm ( just under 36 inches ) wide , and 1000 mm ( 39 + inches ) high. They are spaced at 900 ( 36 inch ) centres. Plywood is 9 mm premium marine grade Meranti. Hulls are Epoxy / glass sheathed outside. The pontoons are not built to any plans as I could not find any suitable at the time.They are plenty strong. Hi, I’ve had the same delemma. A plan to suit our needs is not available. What size framing in the hull do you have. Would love to know as I’m starting to build in the next few weeks. Your looks a nice, well thought out design. How wide---how high, are the pontoons? I AM TRYING TO BUILD THESE. A specification sheet would be so helpful.. There are 3 of us building separate boats here in Florida. Hi Which plan use to built it your pantoons ? What did it cost in materials and furnishings? The engine mount for the outboard motor has been completed. Bolting up the steel channel and more shantyboat plumbing. Working on the Tank Straps. The straps to suspend the waste water tanks for the Shantyboat are now complete. I used 2x 1/8 Inch ( 50 x 3.5 mm ) mild steel. The 1/8 inch thick flat bar was easy to cold form around a simple wooden former , and any minor kinks were lightly tapped out using a ball - pein hammer. Three coats of Kill Rust primer and two top coats of oil based gloss paint complete the finish. Work continues on the waste water tanks. Two month break is over , now it`s onto Waste water tanks. I had a two month break, lots of frost and ice this year, too cold to work outside. This is the last of the interior shelving to be fitted to the cabin space. It's supposed to somewhat resemble the look of the old style luggage racks that was often seen on trains and tram cars in years gone by. Its cold here, painting out the rear cabin of the shantyboat is slow work. Shantyboat progress , rear cabin. Hello Mike , and all following. Progress is slow , but I have managed to do some work fitting out the rear cabin space. Another bed base is assembled and painted , and has been fitted in place. Two small glazed cabinets are being assembled ready to fit in place. The bedside drawer is completed , ready to install. Making the numerous small items for the Shantyboat takes up quite some time. Those little drawers are more work than the bigger items , and as the weather is getting colder here and we head into winter , things are slowing down again. Glue and paint is taking longer to dry ....still , what can you do ...just keep going the best you can I guess . Thank you for stopping by , I appreciate the comments. Wow, love those lockers Harry. Checking in to see how you are doing on the project. Looking good! I have started framing in the built in beds. These are pictures of the bed base / mattress support for the forward cabin. Bathroom door is hung on its hinges. The Shantyboat bathroom door is hung on its hinges. Thought you would be bored with this build by n0w LOL. John Guest plumbing : So simple it`s ridiculous. The Shantyboat is getting plumbing. These John Guest push on fittings make connecting the plumbing a snap.Lighter, faster, and cheaper than copper. If "cleanliness is next to godliness" then washing in your bathroom must be next to being in heaven. very good project! I learned a lot for my next project. My houseboat "Brixholm" has a similar stern. My experience is, that a flat stern at a boat that is no glider reduces speed and take a lot of fuel. It is better to have a conical stern. I construct 2 pieces and will put it on my stern in spring. You can see my houseboat in "youtube" and my name. Photos of the conical stern I have, but I can´t send it on this place. Thank you for the kind words wilddingo. Happy to see you enjoying the posts of my humble build. While I have tried to take some care ,I can assure you that I am certainly not professional boat builder. You are clearly no amateur. The care and skill of this build shows in every detail. On hulls this large I would not do it. To fill these size hulls would add a considerable amount of weight. Foam weighs more than one would think.I robs you of payload. Pontoons are already somewhat weight sensitive. Any water entering the hulls for whatever reason, be it damage / leakage or condensation, would be trapped under the foam , and the water would remain there, potentially causing rot. Inspection would be near impossible, and repairs would be much more difficult. So, in short I sincerely believe water tight bulkheads are recommended, but no foam. Clean , empty plastic canisters / bottles are a possibility, but I don`t believe necessary. I think it would be wise to incorporate water tight bulkheads into your design. Most of my bulkheads have circular cut - outs. in place over sized circular blank off plates cut from marine ply. 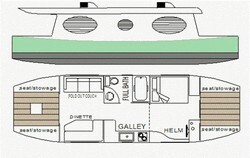 There will be eight separate sealed compartments in the two hulls. I also have eight access hatches placed in the floor inside the cabin, and a further four on deck outside. The hatches will allow the hulls to be vented enough to provide a dry interior if any condensation forms inside. I hope this all makes sense Darryl, thank you for the questions, and your interest. 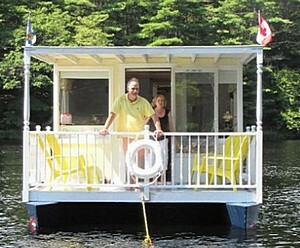 HI I HAVE BEEN THINKING ABOUT BUILDING A PLY PONTOON HOUSEBOAT SIMILAR IN SIZE TO YOURS. BUT WAS GOING TO MAKE EACH BULKHEAD WATERTIGHT AND FILL WITH FOAM AS I SAW ONE ON UTUBE SINK. (2x2) and then added some 20 % extra displacement in the floats by making them 150 mm ( six inches ) wider. It`s difficult to come out on weight , and almost impossible to end up " light." Going " really light " using exotic materials was beyond my budget. Thanks for your interest, it`s appreciated. This is really a great thing your doing by sharing the build with those of us who dream to do this. I have only one question, did you consider using metal studs on non weight bearing areas? So much lighter than pine or spuce.. just wondering.... all the best!! Thank you for the kind comments Andy. Re the hull shape : Precisely my thoughts Andy. The inspiration for the cabin came from the San Francisco cable cars , even Melbourne trams. I have always liked the look of those and this is an attempt to get a somewhat similar look. I think there is a resemblance , even if rather loosely.
" floating Esky " look often seen. Thanks again Andy , your comments are appreciated. Congratulations on a fine addition to the waterfront scenery! Two things make your craft stand out from the awful floating boxes seen elsewhere....the first is the lovely sweep of the bottom curve down from the bow and back up to the stern. This will pay off endlessly in fuel economy and reduced wake. The other is the vintage feel of the upperworks and the attention to period detail. I guess this is a nod to the existing historic vessels around Echuca....or maybe just because it looks so damn good and will never tire of giving pleasure to the occupants. This is Mike (DIY Wood Boat) I have a private message for you from Trish and Harry. If you would contact me using the private contact form here I will pass it on to you. as it all takes three times longer than planned. I love what you are doing, the design and your craftsmanship. Although, I'm a boating person at heart, I lack boating experience and have only ever made a couple of rented houseboat trips on the Murray. I would like to continue to follow your progress as I'm retiring next year and have always planned to build my own boat in retirement. Although, I have a lack of boating knowledge, I have worked with timber all my life and can't imagine not building out of it. I am currently working/living in NSW, but have bought a property at Borrika, not far from Mannnum. Perhaps when I relocate I would be able to see your craft and meet you in person. When last we talked on the net you said you were going to build a site about your boat project. And so is the boat. I love the pictures. That should keep the rain off Harry. You'll have to call in the interior decorators in soon. Thank you for the encouragement Mike. I feel like I`m getting closer ( to finishing that is ) .....guttering is being fitted at the moment , then roofing. Rain expected this week, but spring is in the air for us down under. Hope to have some real progress photos soon.